One of the most popular styles of party, as of late, has to be the foam party. There’s just something about it that gets people of all ages excited. 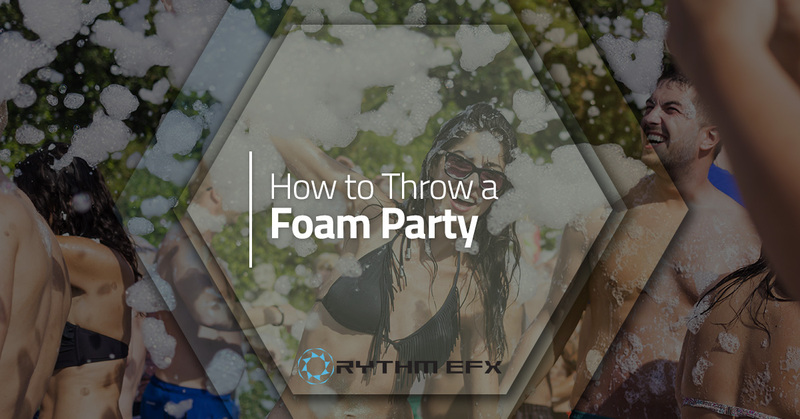 If you’re thinking about throwing your own foam party, whether it’s for a birthday, graduation, or some other celebration, there are considerations you need to keep in mind so everyone can have a memorable and fun experience. With that in mind, we’re going to dive into some tips for how to throw a foam party. For foam party rentals in Fort Collins, call Rythm EFX! We have all of the equipment to turn a boring and basic event into a memorable and magical experience. The first and most important step for planning any sort of event is choosing a venue that fits your needs. This is especially important when it comes to a foam party. You need to take many different factors into consideration when choosing your venue, including the time of year, expected weather conditions (especially for an outdoor venue), the age of the people attending the party, how many people will be at the party, and the water resistance of the venue. For summertime parties, choosing an outdoor venue has a lot of benefits. Firstly, it means that you don’t have to worry about risking water damage from the foam. This also reduces how much you’ll need to clean up. When holding a foam party outside, it’s a good idea to make sure you have a hard surface, like a patio or driveway. If that isn’t possible, throw a plastic sheet down on the lawn to keep the grass safe and maintain the bubbles for longer. If you’re having a kids foam party, adding in a bouncy castle is a great way to keep the bubbles contained in a specific area, while keeping the kids safe from slipping and falling on the hard ground. Since cold weather and wet conditions don’t mix well, it’s a good idea to choose an indoor venue for your fall or winter parties. Discuss with the owner of the venue that you are intending to have a foam party and check with them regarding the water resistance of the dance floor. Some venue owners may not want to have a foam party in their building out of fear of damaging their floors or walls, so this discussion is important to ensure everyone is on the same page regarding what will be happening at the event. You’ll also have to make sure you choose a venue that is large enough to accommodate the number of guests that will be attending your party. Too many people with too little space will make any party uncomfortable, especially when foam is added to the picture. While many people think they can make their own foam with some dish soap, this is not recommended, as it can cause skin irritation and rashes for people with sensitive skin. Not only that, dish soap can get in your eyes. Anyone who has had shampoo get in their eyes knows that burning and stinging sensation, which is not how people want to have a party. Instead, renting a legitimate foam machine like Rythm EFX offers will ensure you avoid those issues, as the foam our machines produce is hypoallergenic and won’t irritate skin. It’s also biodegradable, which means it won’t hurt the environment if you have an outdoor party. Using a foam machine will also make it easier to apply the foam and create less mess than if you try to make your own. Using a plastic sheet will help protect the ground or flooring, so it’s a good idea to make sure you have a large enough sheet to cover the whole area you’ll be using the foam in, or use multiple sheets if you can’t find one big enough. To keep it secure, use duct tape to prevent it from sliding around and foam from seeping between the cracks of the sheets. Depending on the type of venue you choose, you might also want to cover the walls with some plastic sheets to keep them safe as well. Choose furniture that won’t be damaged from water or foam, like plastic lawn chairs and tables. You’ll also want to cover electrical sockets and plugs and keep the DJ booth away from the foam pit to avoid electrocution risks. While people may be tempted to wear some flip-flops for the foam party, it’s not recommended. Not only are flip-flops easy to lose in the foam, they won’t give you very much traction or protection in a slippery and crowded dance floor. Advise your guests to wear shoes to help them stay on their feet and avoid the pain of someone accidentally stepping on them. When you have a slippery floor, it’s awfully tempting to try out your best Tom Cruise impression by sliding across the floor. This is very dangerous, not just for the person sliding, but for anyone they may slide into. It can lead to collisions, resulting in neck and back injuries. It’s also important to avoid picking people up while in the middle of a foam party because the change in weight makes slipping and falling much more likely. It’s a good idea to lay down some ground rules to keep everything under control for some safe fun. People can get pretty rambunctious at a foam party, so it’s a good idea to avoid using glass cups or plates. This will prevent accidentally shattering glass, which can get covered up by the foam. When it’s hidden in the foam, people are much more likely to get hurt by it, cutting up their legs and ankles. Not only that, plastic cups and plates are far easier to clean up at the end of a party than glass, which will require a lot of cleaning before they can be used again. While many cell phones these days claim to be waterproof, they’re at far greater risk of damage than you might think. To avoid damaging these items, provide a safe place for everyone to store their phones when they go into the foam. Whether this is a lockbox or a separate room, your guests will appreciate having someplace to put their things without worrying about them getting damaged or wet. Throwing a foam party is a great way to take a basic and boring event up to the next level. If you’re looking for a foam party machine rental near you, call Rythm EFX. We’re located here in Fort Collins and are proud to serve Northern Colorado. We hope to hear from you soon!